Happy Choppers, a work by the street artist Banksy, is expected to bring between $120,000 and $180,000 at auction in late April. "You Know Who Banksy Is? Pay Up"
An ominous phalanx of helicopters is bristling with weapons, the lead chopper looming—and wearing a pink bow. Auctioneers expect this little graffito, stenciled on a construction site in central London, to bring as much as $180,000 at a sale next month hosted by Julien’s in Los Angeles. It's by Banksy, whose work is poised to fetch even higher prices now that a scientific study is out supporting a theory of the anonymous street artist's identity. Active since the 1990's, Banksy has never revealed himself or herself despite widespread speculation centering on Robin Gunningham, described by a British tabloid as a middle-aged man living in or near London. Regardless, the publicity could jack up the value of Banksy's work. “I think when he’s found out, and if this really is him, his prices will not only be solid, but they will go higher,” said Darren Julien, founder of Julien’s Auctions, which has sold over 50 of Banksy’s works. Julien said Banksy prices could rise 20 to 40 percent this year. “When we look back, the works he did when he was undiscovered, those will be some of his most valuable works,” he said, citing high sales for iconic items musicians used early in their careers. Several art experts consulted by Bloomberg said the value of Banksy’s works normally increases by about 10 percent a year. 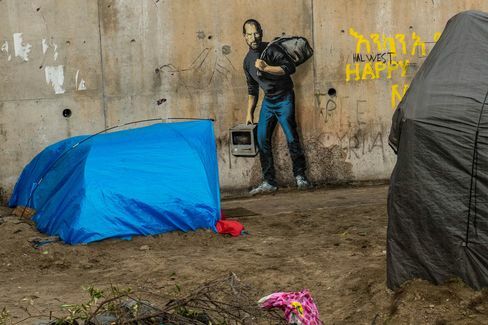 Street art representing Steve Jobs, by elusive British artist Banksy at the migrant camp known as the 'Jungle' in Calais, northern France. “Any time he is in the news, any time he is making a splash, that’s when sales spike,” Swarts said. Banksy's residency in New York City, a wall featuring the visage of Steve Jobs in a refugee camp, and Dismaland, a temporary project that rendered a traditional amusement park in dark tones, all helped Taglialatella’s sales of Banksy’s work, he said. Efforts to reach Banksy for comment, including emails sent to the address on the artist's verified website and to Banksy's art authenticator, Pest Control, were unsuccessful. Pest Control issues limited-edition prints for sale. 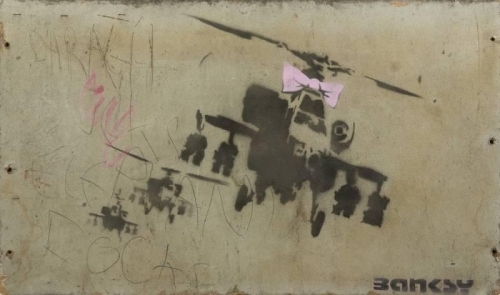 Banksy doesn't profit from the street art itself, such as the helicopters, maintaining that it should remain public for the world to enjoy. The Puccio Fine Art Gallery, which receives about a dozen requests for Banksy’s work a day, also expects an increase in interest, and prices, with the artist’s identity making headlines. 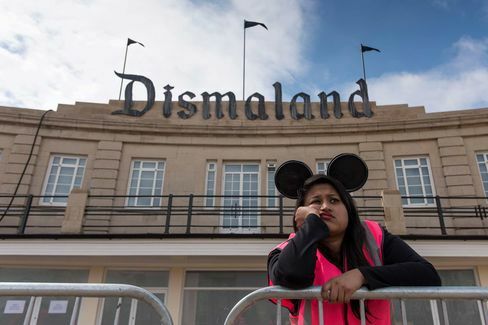 A steward is seen outside Bansky's 'Dismaland' exhibition on Aug. 20, 2015 in Weston-Super-Mare, England. Banksy has already become an institutional figure in the art market, Engelen said. “We might not know his real name, but we know who he is. He’s a great artist." Sebastien Laboureau, a street art expert based in Miami, agreed. “Frankly, I don’t think anyone in the market cares about his identity," he said. Had Banksy's identity been revealed during a career highlight, such as during Exit Through the Gift Shop, or the New York residency, it could have made a bigger splash, Engelen said. So, too, if Banksy's identity was surprising—a well-known artist in disguise or a woman, after years of being assumed to be a man. Still, he said, “the market likes clarity,” and the study adds some of that. “Every time you hear Banksy rumors," said Swarts of the Taglialatella Galleries, the market goes up —"whether they're true or not." Polly Mosendz, of Bloomberg Business, "You Know Who Banksy Is? Pay Up"